Where will you spend A Spanish Hour with MWO this Autumn? 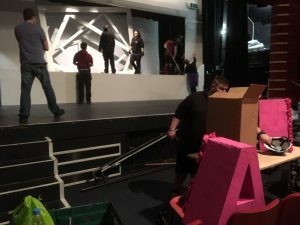 There’s touring – and then there’s Mid Wales Opera’s SmallStages touring – and when we say we’re performing live opera locally across Wales and the Borders that’s exactly what we mean! Our SmallStages tour aims to perform within 40 miles of every community in Wales – as well as visiting unique and beautiful venues along the border. It’s a real privilege to be able to bring our bespoke productions of one act operas, with brand new arrangements, to the heart of communities. Our SmallStages performances are a night out with a real difference and we wanted to introduce you to some of the amazing venues we’re visiting this year. Our performances in Hay on Wye, Fishguard, Barmouth, Aberdovey and Criccieth are supported by Arts Council Wales Noson Allan/Night Out scheme – a brilliant programme which works with volunteer promoters to bring live shows to community venues across Wales. 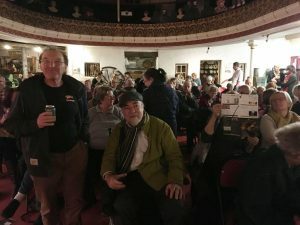 It’s a vital part of the infrastructure of touring performances in Wales and there are many places we, and other touring companies, couldn’t reach without it – hats off to you NightOut and to the community promoters you support! 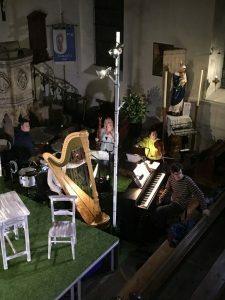 The Allegri Quartet, regular performers at Llanfyllin Festival told their hosts “For warmth and intimacy and glorious surroundings, Llanfyllin can scarcely be beaten” – We agree and it’s the perfect place to open our new production! Second stop on our whistle stop tour of Wales is The Met in Abertillery on November 10th. We’re the first live opera to be performed at The Met despite its more than 100 year history. In its heyday, The Met had a fantastic ballroom and dance floor, and a Victorian Theatre, where many famous names performed – Charlie Chaplin amongst them! We’ve followed in some famous footsteps before but Charlie Chaplin’s are pretty special – the great news is that A Spanish Hour’s really really funny! Next we’re back on home turf in Presteigne Assembly Rooms on November 11th. We rehearse our SmallStages performances in Presteigne and by the time we’re off on tour it’s our cast and musician’s second home. It’s great to bring the show back to this superb little gem of a venue – one of the most intimate performances on the tour so if you’re planning to join us there please book soon! After a short break we’re off to the big city! Our mainstage tours don’t visit Cardiff, but having worked in partnership with the Royal Welsh College of Music and Drama on our tour of Handel’s Semele in 2017, we’re delighted to be back in the lovely Richard Burton Theatre on November 15th! This performance is also signed by Julie Doyle in British Sign Language. A Spanish Hour’s a genuinely funny dramatic production – and we’re hoping Julie’s lively interpretation will allow deaf and hearing-impaired audiences to engage with the show as well. On November 16 and November 17 we’re off to the seaside! Our touring work often reaches coastal communities – another day, another bay – and this time we’re off to the Cambrian Coast visiting Theatr-y-Ddraig/Dragon Theatre Barmouth on November 16th and Neuadd Dyfi in Aberdovey on November 17th. Last year’s visits to both these great little venues were real highlights of the tour! Our work’s all about taking opera to places where it can’t normally be performed and both of these theatres fit the bill perfectly. With a wonderful welcome from audiences – and even a dog in a basket on the front row in Aberdovey – we can’t wait to return this year. With a short pit stop, we’re back on the road on November 21st at Pontardawe Arts Centre. As small theatres in Wales go this one is incredibly special and we’re utterly delighted to be returning this year. 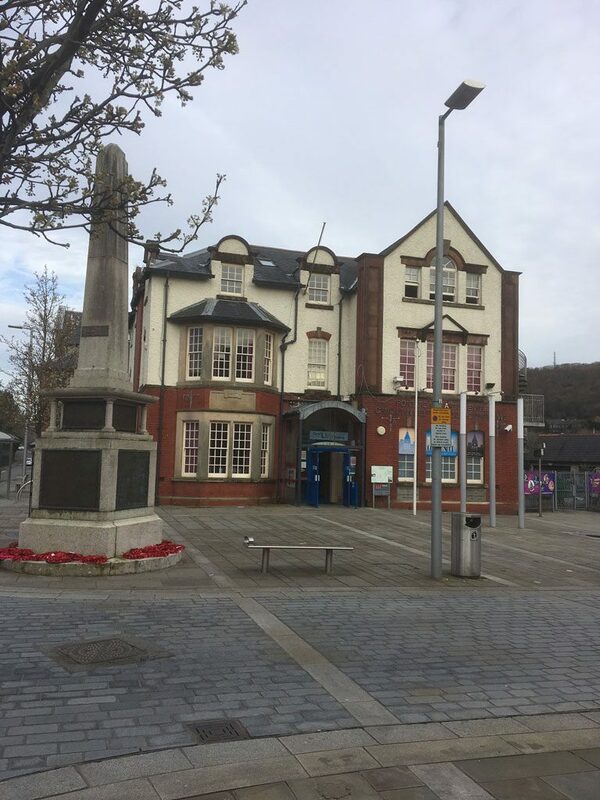 We last visited Pontardawe in Spring 2017 on our tour of Mozart’s The Magic Flute. It’s not only an incredibly beautiful theatre but really well run and with a welcoming audience who made us feel completely at home and privileged to be there. Thanks Pontardawe – we’ll see you soon. Next we’re back to the Borders and a visit to Hay-on-Wye on November 22nd as part of Hay Festival’s Winter Weekend. Once again we’re performing in the very beautiful St Mary’s Church, another favourite venue from last year’s tour of Walton’s The Bear and a truly unique space in which to perform live opera. On November 23rd we go West, in fact about as far west as you can go –to Theatr Gwaun in Fishguard. 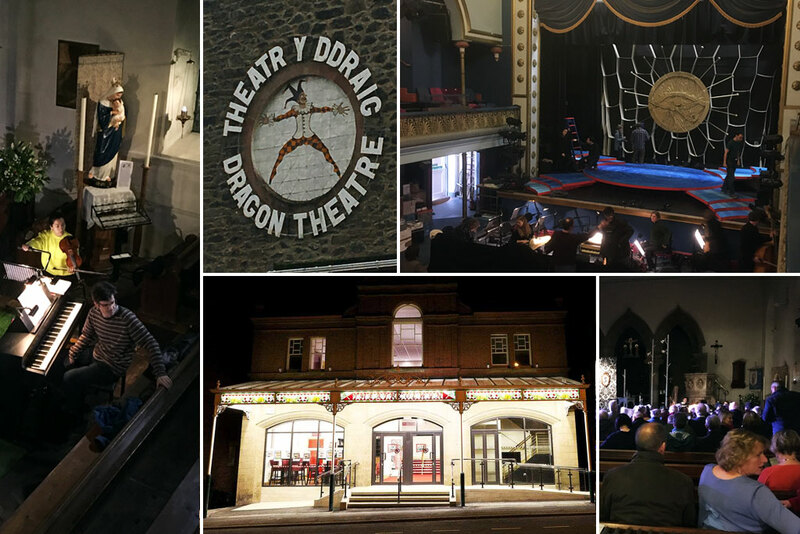 One of Wales’ first ever cinemas and with films running since the 1920s, Theatr Gwaun also hosts a programme of live theatre shows and has been entertaining audiences since the 1890s! It’s a new venue for us and allows us to reach some of the most remote communities in Wales – and of course to visit magical Pembrokeshire, cue sighs and memories of campervan visits this summer from our Exec Director! We’re back on home turf on November 24th in Trefeglwys Memorial Hall for our second performance in partnership with our home theatre Hafren, Newtown. It’s our Production Manager’s local venue and just down the road from our opera stores in Caersws. Last year’s opening night in Llandinam Village Hall sold out and was a resounding success, so we have high hopes. Another short break then on November 29th we arrive at SpArC in Bishop’s Castle, Shropshire in partnership with Shropshire Music Trust. SpArC’s another great venue at the heart of its local community and right next door to the town’s Community College. It hosts a mix of live events, cinema and screening including a popular live screened opera programme – so if you’ve seen screened opera in Bishop’s Castle previously now’s the chance to see our incredible professional performers live on stage. On November 30th we visit the only venue which hosts both our SmallStages and MainStage tours – Theatr Clwyd in Mold. Theatr Clwyd’s an excellent venue for both drama and classical music, and whether it’s our SmallStages show in the studio theatre or our MainStage performance of Tosca on Sunday March 24th 2019 in the auditorium it’s always a great place to perform and a night we all look forward to. On December 1st we return to Criccieth Memorial Hall – another highlight from last year’s tour of The Bear and another seaside venue, you can definitely see a theme developing here. The beautiful Art Deco Criccieth Memo, opened by local hero and former Prime Minister David Lloyd George in 1922 is the kind of venue touring companies like us really treasure – brilliantly run, with great facilities and a mix of visiting and local performances including homegrown productions by the Starlight Players. Another short break and we’re off to Theatr Colwyn, Colwyn Bay on December 5th. Theatr Colwyn’s another venue with fond memories from our 2017 Spring tour of Semele. It’s a beautiful little theatre with a strong local following – and just down the road from the much larger Venue Cymru in Llandudno which regularly hosts performances by our friends at WNO. We’re back on home ground on December 6th, for our third performance with Hafren, Newtown at Abermule Community Centre. Abermule’s another venue we’re returning to following a great evening with our performance of Walton’s The Bear last Autumn. It’s another venue attached to a school, and a lively community hall more used to hosting the local cubs and guides than a live opera – but we hugely enjoyed our last visit and we’re delighted to be back there. Last but not least is our performance in Ludlow on December 7th. With the Ludlow Assembly Rooms closed for refurbishment, the performance has been moved to the beautiful St Laurence’s Church right in the middle of town. Tickets are on sale via the Assembly Rooms box office – and we don’t mind a bit giving our final performance of this tour in the “Cathedral of the Marches”. The church is well used to hosting choral and orchestral events and a truly stunning setting for our final performance of this tour. With 16 performances between November 9th and December 7th our SmallStages tour is a huge commitment and a unique opportunity to see opera live and locally – performed by a superb cast of professional singers and brilliant musicians led by our Music Director Jonathan Lyness whose new arrangement of Ravel’s score makes touring at this scale possible. The production’s sung in English, as all our tours are, and with a brand new translation by our Artistic Director Richard Studer who has had great fun bringing a fresh witty slant to the piece. We’re coming soon to a venue near you! Where will you spend A Spanish Hour with Mid Wales Opera this Autumn? Hi .. are you performing anywhere in the or near to the Rhondda valleys please. The closest may well be The Met in Abertillery on November 10th. Not sure how far that is from you – or Pontardawe on November 21st?